Glaze on glaze on glaze on glaze. Grind your oats to make a flour. 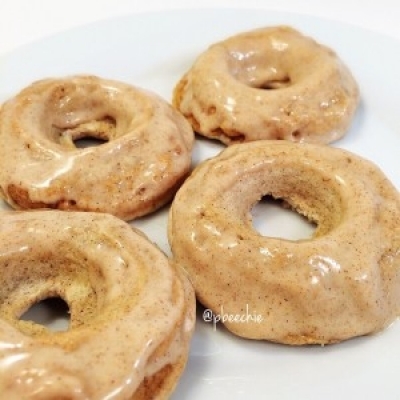 Then add the remaining donut batter ingredients (protein powder, banana, egg whites, cinnamon, baking powder, and stevia) and blend again. Spray a donut mold with nonstick spray and pour your batter into 4 molds. Bake at 350 F for 10 mins. Remove and let cool. For the glaze, mix the protein powder, almond butter, and a little water to desired consistency; it should be thick so add the water slowly! Glaze your donuts and enjoy! !